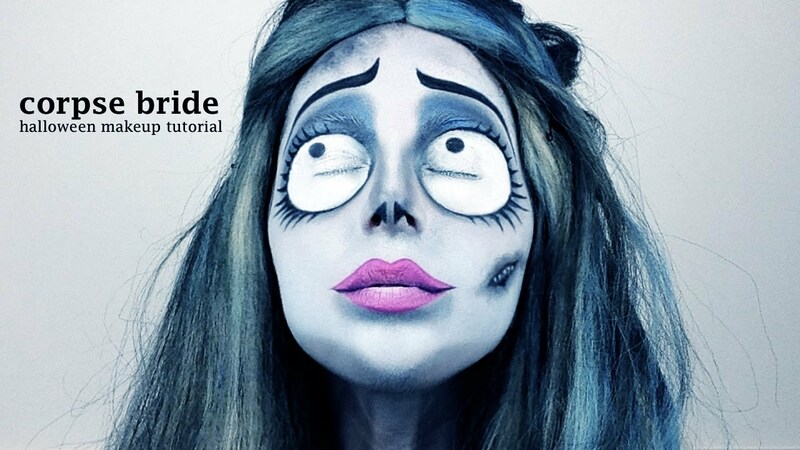 Corpse Bride Emily | Halloween costume | How to do it yourself? If you love Tim Burton then you must know who Emily is, but if you haven't watched Corpse Bride then get on it immediately! :D In my country Halloween is not a holiday, but some people still celebrate it, and I think it's fun to disguise, so that's why I like this holiday. This was the first Halloween that I wanted to celebrate, but I didn't feel well so I did not go anywhere. But I did this makeup for some competition which I won, and I'm so happy it payed off, because it was not that easy to do the makeup, although I would do it anyway some day because I planned that for a long time. What you'll need for this look is blue, black and white face colours and pink lipstick. The ones that I used are by Snazaroo, and they are very easy to apply because you mix them with water. And for the costume you'll need a white dress, a hair band with black flowers and a veil. 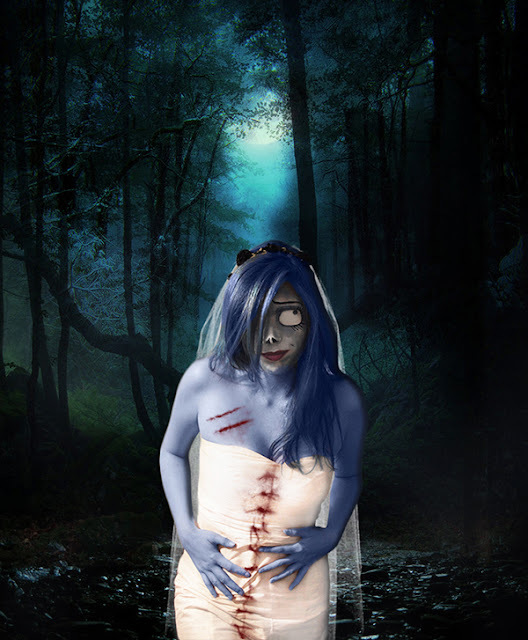 Since I did this for a competition I didn't need the veil so I just added it in photoshop. 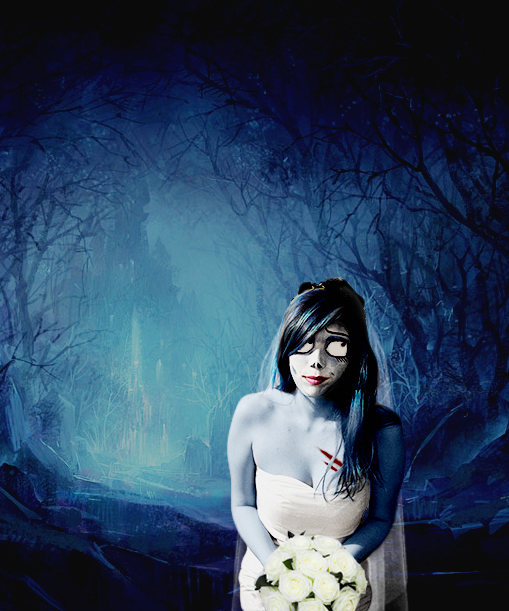 When some people saw the picture they thought that it's all photoshop, but actually I just changed the background and added small things like wounds, veil and bouquet. So makeup is real, except that in these pictures I completely deleted my eyes, because it's very hard to hide them. And of course if I ever wanted to go like this to a costume party, I would do eyes differently because obviously I couldn't hang out with my eyes closed. Za ovaj izgled sam koristila plavu, crnu i belu boju za lice kao i roze karmin. Boje koje sam koristila su Snazaroo, i veoma se lako nanose jer se mešaju sa vodom. A za kostim će vam trebati bela haljina, rajf sa crnim ružama i veo. S obzirom na to da sam ovo uradila samo za takmičenje nije mi trebao veo, već sam ga dodala u fotošopu. Neke osobe koje su videle prvu sliku su mislile da je sve fotošop, ali samo sam izmenila pozadinu i dodala neke sitnice kao što su rane, veo i buket. Tako da je šminka stvarna, osim što sam skroz izbrisala oči jer ih je teško sakriti sa bojama. I naravno ako bih ikada isla na neki maskenbal ovako drugačije bih našminkala oči jer očigledno ne bih mogla da ih držim zatvorene sve vreme. Awesome post, dear. Following you back on GFC.